Pittsburgh Pirates left fielder Adam Frazier (26) watches the flight of his three-run home run against the Chicago Cubs during the ninth inning on April 16, 2017, at Wrigley Field in Chicago. For most of Pittsburgh the cold, rainy, snowy days are unavoidable for the next several weeks. However, the Pittsburgh Pirates get to escape the rough Northeast winters as they head down to Bradenton, Florida, for spring training. As pitchers and catchers officially begin workouts on Wednesday and position players arrive the following Sunday, the Pirates will prepare for the start of the 2019 season, following a winning –– yet largely inconsistent –– 2018 season. With the lack of significant additions and the largely unproven talent across the roster, don’t expect big things from the Pirates this year. And with the No. 16 minor league system across baseball, according to Baseball America, the future remains up in the air. 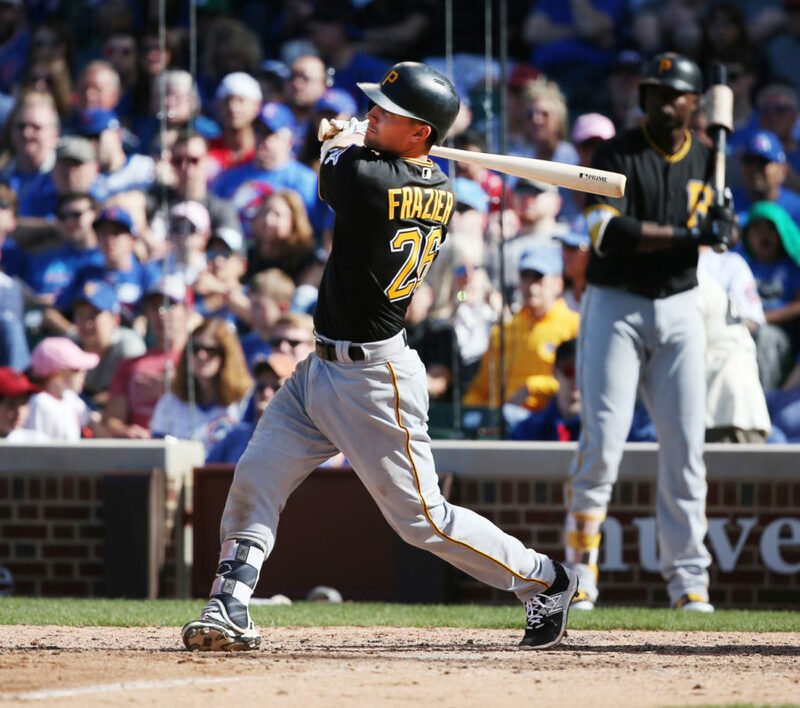 However, with the emergence of players like Jameson Taillon and Trevor Williams at the front end of the rotation and seasoned hitters like Starling Marte, Francisco Cervelli and Corey Dickerson in the lineup, the Pirates should still find themselves between mediocrity and average for the majority of 2019. Last season the Buccos finished 82-79, placing fourth in the NL Central, behind the Cubs, Brewers and Cardinals. With the trades of franchise cornerstones outfielder Andrew McCutchen and right-handed pitcher Gerrit Cole, coupled with the recent success of the Chicago Cubs, the consistent quality of play from the St. Louis Cardinals and the offseason moves of the Milwaukee Brewers, not much was expected from the Pirates going into last season. Still, the Pirates managed to find themselves in the thick of things at 57-52 through the trade deadline after they went 17-9 through July. That spurt included an 11-game win streak, which then prompted the trade for RHP Chris Archer. Despite the momentum, the Pirates flamed out in August. The Buccos went 10-17 during that month, effectively taking themselves out of the Wild Card hunt. The offseason moves by general manager Neal Huntington were mostly insignificant. Among the most notable moves made by the 13-year GM is the re-signing of infielder Jung Ho Kang, who missed most of last season, and the signings of utility man Lonnie Chisenhall, OF Melky Cabrera and LHP Francisco Liriano, who was on the Pirates from 2013 to 2016 before getting traded to the Toronto Blue Jays. Following some legal troubles that caused him to miss the entire 2017 season and most of the 2018 season, Kang made his return late last year, recording just six at-bats and mustering two hits. After declining the team option on Kang, the Pirates re-signed him to a one-year deal. Kang will look to return to his 2016 form when he hit 21 home runs and 62 RBIs in just 103 games. Chisenhall, an eight-year veteran, signed a one-year deal this offseason to join just his second major league squad after spending his entire career with the Cleveland Indians. Since making his career debut with Cleveland in 2011, Chisenhall is a .268 career hitter in 688 games. However, the 30-year-old played only 29 games last year due to a calf injury. Chisenhall will provide some depth for manager Clint Hurdle, having played all three outfield positions as well as first base and third base over the course of his career. The most notable of moves was the acquisition of OF Melky Cabrera, who came aboard on a minor league deal on Sunday. The 34-year-old will enter his 14th season, having spent time with seven different clubs, most recently the Indians. A career .286 hitter, Cabrera has played all three outfield positions, primarily serving as a corner outfielder in recent years. After signing with Cleveland midway through last year, Cabrera hit .280 with 17 doubles in 78 games. Liriano rejoins the Buccos on a minor league contract after spending the last two and a half years with three different clubs. Liriano made 26 starts for the Detroit Tigers in 2018, salvaging a 4.58 ERA in 133.2 innings pitched. The 35-year-old will look to return to form from his previous stint with the Pirates, a stretch that saw him pitch to a 3.26 ERA in 510.1 innings from 2013 to 2015. Some of the other signings the Pirates made include INF Nick Franklin (.270 AVG in 2016), OF JB Shuck (70 G in 2018), RHP Jordan Lyles (4.11 ERA in 2018) and RHP Brandon Maurer (31.1 IP in 2018). While the Pirates have signed a number of players, there haven’t been many notable departures this offseason. Infielder Josh Harrison, shortstop Jordy Mercer and RHP Ivan Nova are among the most notable players who won’t be back in the black and gold in 2019. After having shoulder surgery last year, OF Gregory Polanco is expected to be ready sometime in May. Starting off the season rough by hitting .213 in the first two months, Polanco had a career year in 2018, accumulating 23 home runs, 32 doubles and 83 RBIs with an .839 OPS in 130 games before missing most of September. In the meantime, look for Chisenhall to handle the duties against right-handed pitching, while Frazier can move to RF against left-handed pitchers, allowing Kang to slide in at 2B. Filling out the bench will likely be some combination of Kang, Cabrera, Shuck, Catcher Elias Diaz, INF Erik Gonzalez and first baseman Jose Osuna. Joining Polanco on the shelf to start the season are LHP Chad Kuhl and RHP Edgar Santana, both of whom are expected to miss the entire 2019 campaign after undergoing Tommy John surgery in September and October, respectively. For the rotation, Taillon, Archer and Williams will almost definitely take up the first three spots. As far as the last two spots go, Hurdle will have to choose two out of a group comprised of Liriano, Lyles, RHP Joe Musgrove and RHP Nick Kingham. Musgrove put together 19 starts in 2018, his third season, compiling 115.1 innings pitched and a 4.06 ERA. Kingham, on the other hand, struggled as a rookie, pitching to a 5.21 ERA in 18 games, 15 of those as a starter. Liriano and Lyles both have plenty of experience, but with Liriano’s decline over the past couple of years and Lyles’ lack of sustainable success as a starter after being a first-round draft pick by the Houston Astros in 2011, it’s very possible that Hurdle opts for the younger arms. But don’t get your hopes up too much. As any Pirates fan knows, you’ll probably be disappointed. The Pirates begin their spring training campaign on Feb. 23 against the Phillies, with the regular season opening day coming on March 28 against the Reds on the road. The Buccos will make their 2019 home debut on April 1 to take on the Cardinals.